Syllabus of the Online Course (Subject): European Parliament of the European Union. The European Parliament is an institution of the European Union (Europe) whose main objective is to legislate, establish the budgets of the EU and to promote human rights and peace in the EU and around the world. The European Parliament and the European Council adopt most of the European Union's laws on issues such as economic governance, energy, transport, environment, immigration or consumer protection. The European Parliament, as a forum for political debate, is made up of deputies representing all the EU member states, these deputies are elected by universal suffrage in each country, representing 500 million Europeans. 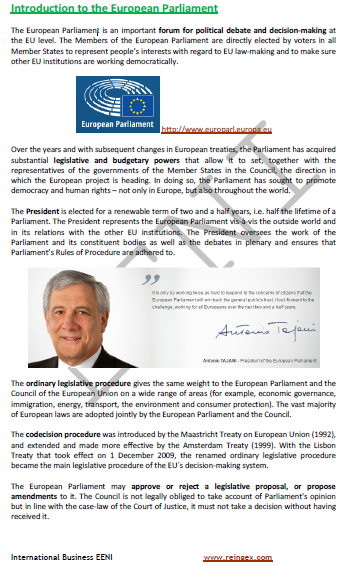 The European Parliament plays a key role in the election of the President of the European Commission. All the countries of the European Union (Austria, Belgium, Bulgaria, Croatia, Cyprus, Denmark, Estonia, France, Finland, Germany, Greece, Hungary, Ireland, Italy, Latvia, Lithuania, Luxembourg, Malta, the Netherlands, Poland, Portugal, Slovakia, Slovenia, Spain, the United Kingdom (BREXIT), the Czech Republic, Romania, and Sweden) are members of the European Parliament. The European Parliament belongs to the European Economic Area (Western Civilisation).